Georgia’s ancient and vibrant capital city spreads out on both banks of the Mtkvari River, and is surrounded on three sides by mountains. The most widely accepted variant of the legend of Tbilisi’s founding says that in the mid-5th century AD, King Vakhtang I Gorgasali was hunting in the heavily wooded region with a falcon. The King’s falcon allegedly caught or injured a pheasant during the hunt, after which both birds fell into a nearby hot spring and died from burns. King Vakhtang became so impressed with the hot springs that he decided to cut down the forest and build a city. 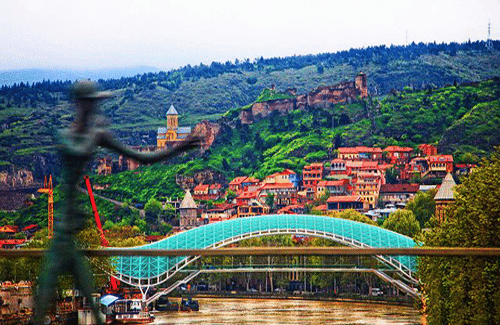 The name Tbilisi derives from the Old Georgian word “tbili”, meaning warm. In this 1 day tour you have a possibility to see capital of Georgia- Tbilisi, especially: Narikala Fortress, Old Tbilisi, Georgian National Museum and Funicular / Mtatsminda Park.